Whether you’re a marathon runner, a stressed-out worker bee, or an older adult dealing with chronic pain, a gentle yoga practice can be of great benefit. 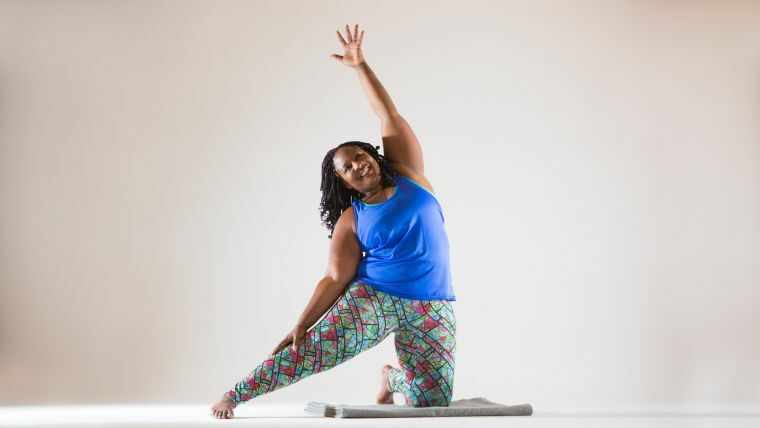 Gentle yoga is an opportunity to reconnect with your breath and body, to meet yourself with kindness, and to reset your nervous system. The following practice is appropriate first thing in the morning or last thing at night. It’s also a great practice to do during a break, at lunchtime, or right after work to help you shift gears from one part of your day to the next. 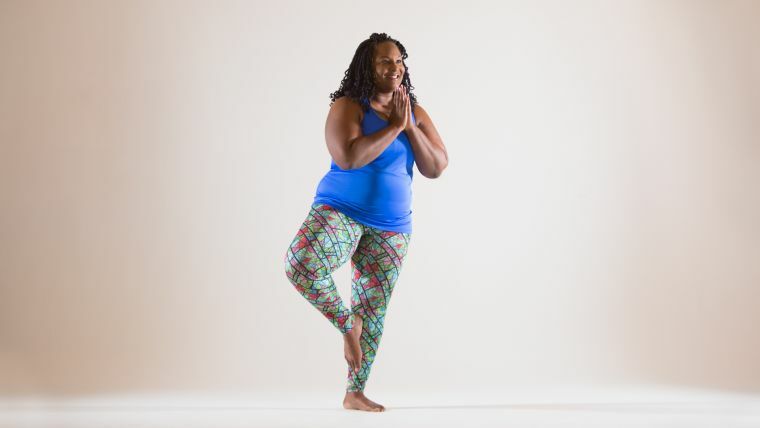 While this 15-minute sequence is not focused on any particular health issue or injury, by dropping your awareness down into your body and moving mindfully into poses (both new and familiar), it meets you wherever you are. The following practice is appropriate first thing in the morning or last thing at night. It’s also a great practice to do during a break, at lunchtime, or right after work to help you shift gears from one part of your day to the next. Props: Two blocks and a blanket. 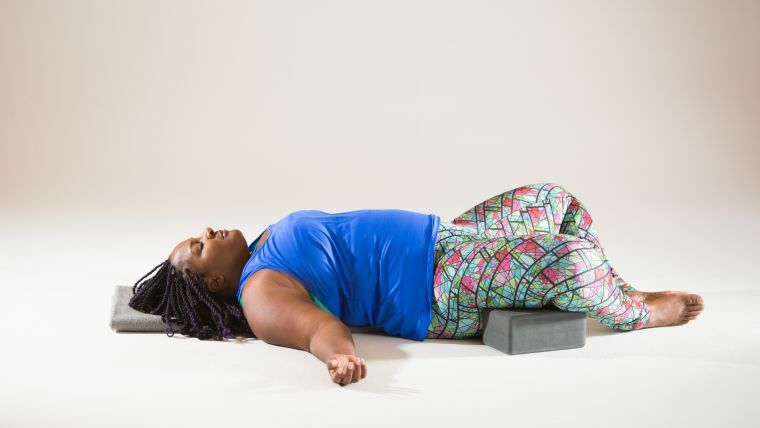 Begin in constructive rest pose: Lie on your back with your knees bent, feet wider than your hips, and toes pointed slightly inward to facilitate the inward rotation of your thighs. Let your knees rest against each other. Cross your arms over your chest, fingertips resting on your outer shoulders, and allow your elbows to drop down. With each exhalation, surrender a little more to the pull of gravity and the support of the ground. Stay for five to ten breaths. Then re-cross your arms with the opposite elbow on top, and repeat. Stretch your arms out to a T, with palms facing up. Lengthen from your sternum out through elbows, wrists, and fingers. Then relax your arms, feeling their weight against the floor. Keeping your feet wider than your hips, slowly drop your knees to the right. Come back to the center and drop them to the left. Move at whatever pace is comfortable and that allows you to maintain awareness of the movement in your thighs, pelvis, and lower back. After flowing back and forth a few times, let your knees stay to the right and slightly scoop your tailbone under. You may feel a stretch across the left outer hip and front of the left thigh. To deepen this sensation, place the right ankle on top of the lower left thigh, just above the outer knee. Avoid pushing your left knee down to the floor; instead, imagine lengthening the left femur bone toward the right corner of your mat. Reach your tailbone in the same direction. Remain here for three to five breaths. Then return to constructive rest pose, and repeat on the other side. Come back to center. Place your arms at your sides, and lift your feet off the ground until your knees are directly over your hips, with the thighs vertical and the shins horizontal. 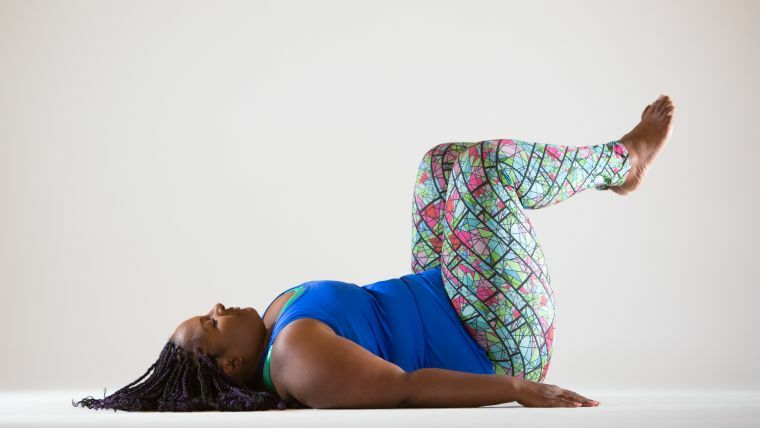 In this pose, the goal is to engage the deepest layer of your abdominal muscles in order to stabilize a neutral spine (where there’s just a little bit of space between the lower back and the ground—but not an excessive arch) in response to the weight of the legs. The action of pulling your front hip points toward the navel may be helpful. Take five to ten breaths. If holding this position is too challenging, or if there is any discomfort in the lower back, try bringing your knees a little closer to your chest (while still leaving the back of the pelvis on the mat and maintaining a slight lift in the lumbar spine). 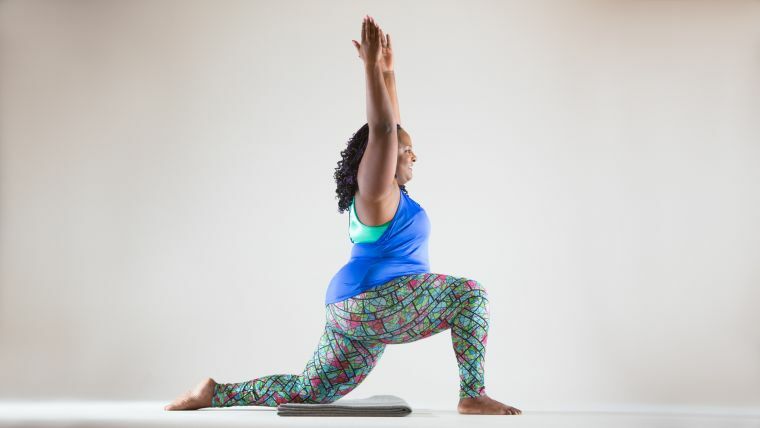 Lower your feet to the mat, making sure they are parallel, with your heels under your knees. Press into your feet to lift your hips for bridge pose (setu bandhasana), and take five to ten breaths. Don’t worry about bringing your hips high. The purpose of the pose here is simply to open the front body and strengthen the back body. To maintain the integrity of the alignment without stress, draw your inner thighs down and reach your tailbone toward your knees. Roll down, one vertebrae at a time, and make your way to all fours, with wrists under shoulders and knees under hips. Because you will be in this position for a while, you may wish to place a blanket or other padding under your knees. Flow through cat and cow as many times as you’d like. Try sliding the torso a little forward on cow and a little back on cat. Feel free to play around with this mini-vinyasa, adding any extra movements that help to loosen areas of tightness or holding in your back or shoulders (e.g., bending from side to side, circling your hips, or anything else you’d like). Return to center. 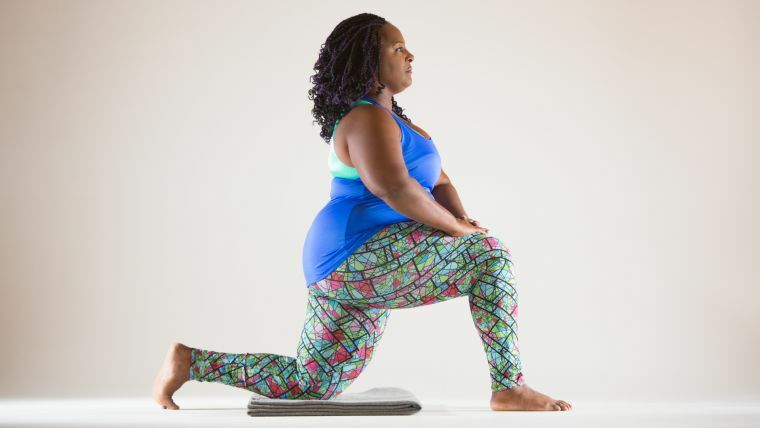 Keeping your hips stacked over your knees, walk your hands forward until you can lower your forehead to the mat or a block while maintaining straight arms. Come up onto your fingertips to tent your hands and lift your forearms. Lengthen all the way from your tailbone to the base of the skull. Take five breaths in this active version of puppy pose (anahatasana). Return to all fours, and step your right foot between your hands. Gather your hands on top of your right thigh, just above the knee, and lift your torso to vertical. Press your right foot into the ground, and encourage your hip points to face forward (not down). Inch the right foot a little bit forward as you also slide the pelvis forward, coming into a low lunge (anjaneyasana). In standard yoga classes, this pose may be taught as a powerful backbend. For this practice, by carefully maintaining an upright torso, you can focus the work more on the deep hip flexors of the back leg. These muscles can be very tight if you sit a lot. If you would like to add a bit of additional spinal extension, let it express itself as a lift in the upper back and an opening of the shoulders, so that there is no compression in the low back. The pose may still feel intense, so move carefully while maintaining slow deep breathing. Stay for five to ten breaths, and then put your hands on your hips and draw the pelvis back over the left knee. Extend your right leg and open it to the side, with toes and knee pointing forward. The right heel should be either in line with the left knee or slightly in front of it (depending on how open your hips are). Adjust the leg position so that you can maintain a square and level pelvis. As you inhale, raise your left arm. Bring awareness to the whole left side of your body and the feeling of lengthening as you exhale and bend sideways over the right leg for gate pose (parighasana). Notice if you are dropping into your low back. What do you need to do to maintain more clarity in the side bend? Support in the low abdominal area may help. Stay for five to ten breaths. Rest in child’s pose (balasana). Then repeat anjaneyasana and parighasana on the other side. Stand up for mountain pose (tadasana). Mountain pose in this practice consists of simply standing with awareness. Close your eyes and feel the weight of your body travel through your bones and into the foundation of your feet. Stand tall, with your muscles lightly engaged and senses soft. Take five conscious breaths here. Open your eyes and shift your weight into your right leg. Place the sole of your left foot on your inner right shin. Bring your palms together, with the thumbs at your sternum. Look at a stable spot in front of you, with your gaze soft and steady. Hold tree pose (vrksasana) for five to ten breaths. Change sides. Fold a blanket into thirds widthwise. Sit in front of one of the short edges of the blanket, bringing the soles of your feet together, and let the knees drop away from each other. Place blocks under your thighs for support. Lie back with the blanket underneath the spine. If your chin lifts, fold the top of the blanket down to make a pillow for your head. The forehead and chin should be more or less on the same plane. 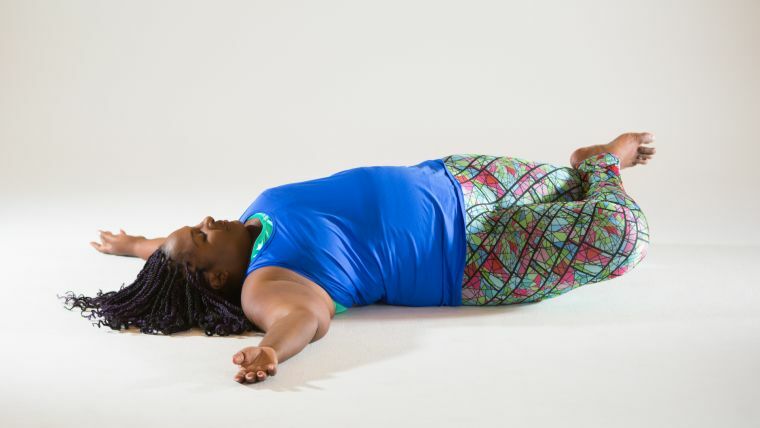 This is reclining bound angle pose (supta baddha konasana), and it will be your final resting pose. Close your eyes and reconnect with your breath. First, match the length of your exhalation to the length of your inhalation, and then take a few rounds lengthening the exhalation. Eventually release any control of the breath and just rest. Stay for three to five minutes. Roll off the blanket, remove it, and return again to your back. 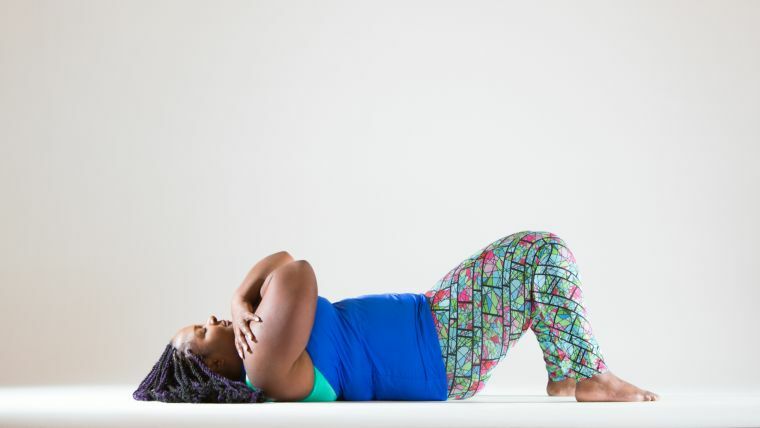 Hug your knees into your chest, and then roll to your right side. Take a couple of conscious breaths and then sit up on a blanket or block. If that’s not comfortable, feel free to sit on a chair. 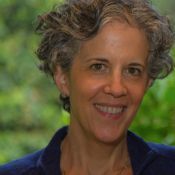 Take a moment to savor the effects of your practice.